The official website of the Hoosic River Greenway in Hoosick Falls, NY. Located on the Hoosic River, among the bucolic foothills of the Green Mountains in the town of Hoosick, in northeast corner of New York's Rensselaer County. The greenway is a joint venture of the Village of Hoosick Falls and the Hoosic River Watershed Assn (HooRWA). Currently in development, it will become a natural preserve dedicated to outdoor recreation activities like hiking, biking, picknicing, fishing, bird watching, snow shoeing and cross-country skiing. The HRG is always looking for volunteers to join the committee. The committee meets throughout the year. Meetings are generally posted to the Village of Hoosick Falls calendar. Or contact the webmaster. All are welcome to attend. LandWorks has completed our conceptual master plan. You can view various details of their proposal on the News & Events page. Have a look and let us know what you think. Public input on the project is always appreciated and will insure that the Greenway becomes everybody's trail. It’s hard to say where our rivers stop and our communities begin, so interconnected are they in time and space. Here in the Hoosic River watershed, water powered the mills around which our towns grew. Floodwaters built the rich fields that still grow crops and support livestock. Though for a bleak time our rivers carried away our wastes, now we boat on those rivers and swim in them. We run along them and bike near them – in those rare locations where we can get to them. For on this great network of water, access to our rivers is limited. 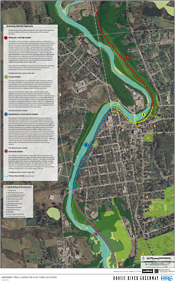 In the Village of Hoosick Falls, NY, the Hoosic River Greenway is changing that. 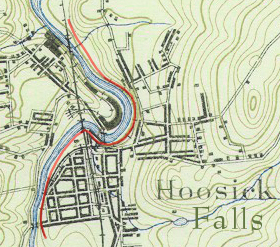 In January 2009, the Village acquired 2.5 miles of abandoned railbed along the Hoosic River in the Village, the heart of the Hoosic River Greenway. When developed, these core parcels and, eventually, additional lands stretching north and south, will provide an entirely new kind of recreational resource for the community. Walkers, bikers, skiers, anglers, floaters, nature enthusiasts and others will enjoy the trail, its natural setting, its sitting and picnic areas, and the Hoosic River.